Our simple but functional plant caddy helps you easily move the flower pot or other heavy things, must be a good helper to your life. Coated by black powder, which make it rustproof and possible for outdoor use,while protect it from the water that might leak from plant. The wheels enables easy movement of potted plats and heavy items frequently moved and conveniently lock into place once you get it situated. Handy when sweeping up. Also it help with stopping the dreaded slugs getting into your pots so an additional bonus! Give your home a Healthy and Comfortable Living Environment. This Plant Dolly Desgin to Bring a way of Smart Life ,Let Home Fashion Never Fade. .You can use the screw on the wheel directly by twisting it into the hole in the base of the flower pot，and then you can use it! 1. The Plant Caddy's Weight Should be less Than its Load Weight. 2.The wheels can be freely disassembled or assembled according to actual needs. 3. The Size of the Planter had better be Less or Same with the Plant Dolly's Inner Diameter. 4. Due to the manual measurement, there may be some difference on size, specific size to actual supply prevail. Don't put over 88LB heavy plant on this stand, please fix the wheel to the stand firmly and move it slowly to keep the using life time.MULTI PURPOSE: Widely used indoor and outdoor for moving garden pots, heavy plants, potted trees, large vases, whiskey barrels, trash cans or else and can protect your floor from being worn out. Spanner is provided free of charge. UPGRADED WHEEL: The locking wheel to keep caddie securely in place, it can be freely disassembled or assembled, which allow easily carry heavy planters around your home or garden without damage your floor. STRONG LOAD BEARING: Our metal flower pot caddies is 10 inch in diameter. This round planter stand is strong enough to hold up to 88LB planters, enables easy movement for potted plants and heavy items that are frequently moved. 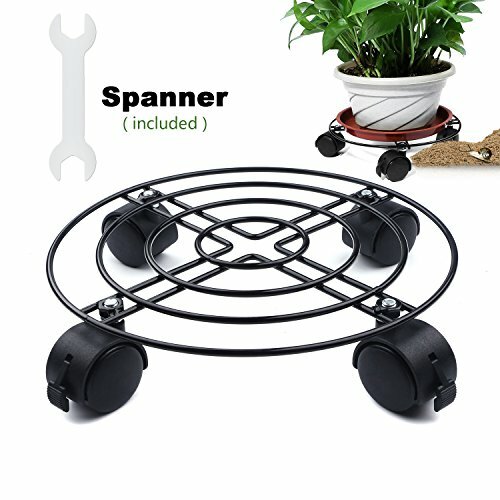 FIRM CONSTRUCTION: This metal plant stand is consist of 4 heavy duty wheels, make it available to carry up heavy flower pot around your home and no worry about cracking while moving. SATISFACTION GUARANTEE: We strive to provide you with the highest quality product and the best customer experience possible; our plant caddy is guaranteed;100% money back lifetime guarantee,so enjoy your risk-free purchase. If you have any questions about this product by Green Bean, contact us by completing and submitting the form below. If you are looking for a specif part number, please include it with your message.